In 1981, Intel Corporation introduced an 8-bit microcontroller called the 8051. This microcontroller had 128 bytes of RAM, 4K bytes of on-chip ROM, two timers, one serial port, and four ports (each 8-bits wide) all on a single chip. At the time it was also referred to as a "system on a chip." The 8051 is an 8-bit processor, meaning that the CPU can work on only 8 bits of data at a time. Data larger than 8 bits has to be broken into 8-bit pieces to be processed by the CPU. The 8051 has a total of four I/O ports, each 8 bits wide. See Figure 1-2. Although the 8051 can have a maximum of 64K bytes of on-chip ROM, many manufacturers have put only 4K bytes on the chip. This will be discussed in more detail later. 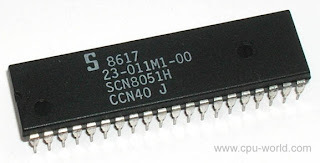 The 8051 became widely popular after Intel allowed other manufacturers to make and market any flavors of the 8051 they please with the condition that they remain code-compatible with the 8051. This has led to many, versions of the 8051 with different speeds and amounts of on-chip ROM marketed by more than half a dozen manufacturers. Next we review some of them. It is important to note that although there are different flavors of the 8051 in terms of speed and amount of on-chip ROM, they are all compatible with the original 8051 as far as the instructions are concerned. This means that if you write your program for one, it will run on any of them regardless of the manufacturer. The 8051 is the original member of the 8051 family. Intel refers to it as MCS-51. Table 1-3 shows the main features of the 8051. There are two other members in the 8051 family of microcontrollers. They are the 8052 and the 8031. The 8052 is another member of the 8051 family. The 8052 has all the standard features of the 8051 as well as an extra 128 bytes of RAM and an extra timer. In other words, the 8052 has 256 bytes of RAM and 3 timers. It also has 8K bytes of on-chip program ROM instead of 4K bytes. Although the 8051 is the most popular member of the 8051 family, you will not see "8051" in the part number. This is because the 8051 is available in different memory types, such as UV-EPROM, flash, and NV-RAM, all of which have different part numbers. A discussion of the various types of ROM will be given in Chapter 14. The UV-EPROM version of the 8051 is the 8751. The flash ROM version is marketed by many companies including Atmel Corp. and Dallas Semiconductor. The Atmel Flash 8051 is called AT89C51, while Dallas Semiconductor calls theirs DS89C4xO (DS89C420/430/440). The NV-RAM version of the 8051 made by Dallas Semiconductor is called DS5000. There is also an OTP (one-time programmable) version of the 8051 made by various manufacturers. Next we discuss briefly each of the above chips and describe applications where they are used. Another major producer of the 8051 family is Philips Corporation. Indeed, they have one of the largest selections of 8051 microcontrollers. Many of their products include features such as A-to-D converters, D-to-A converters, extended I/O, and both OTP and flash. For the list of companies producing the 8051 family see the Web sites in the box below. In Section 2.1 we look at the inside of the 8051. We demonstrate some of the widely used registers of the 8051 with simple instructions such as MOV and ADD. In Section 2.2 we examine. Assembly language and machine language programming and define terms such as mnemonics, opcode, operand, etc. The process of assembling and creating a ready-to-run program for the 8051 is discussed in Section 2.3. Step-by-step execution of an 8051 program and the role of the program counter are examined in Section 2.4. In Section 2.5 we look at some widely used Assembly language directives, pseudocode, and data types related to the 8051. In Section 2.6 we discuss the flag bits and how they are affected by arithmetic instructions. Allocation of RAM memory inside the 8051 plus the stack and register banks of the 8051 are discussed in Section 2.7. In this section we examine the major registers of the 8051 and show their use with the simple instructions MOV and ADD. information temporarily. That information could be a byte of data to be processed, or an address pointing to the data to be fetched. The vast majority of 8051 registers are 8-bit registers. In the 8051 there is only one data type: 8 bits. The 8 bits of a register are shown in the diagram from the MSB (most significant bit) D7 to the LSB (least significant bit) DO. With an 8-bit data type, any data larger than 8 bits must be broken into 8-bit chunks before it is processed. Since there are a large number of registers in the 8051, we will concentrate on some of the widely used general-purpose registers and cover special registers in future chapters.